There is an excitement in the air. Commercial agricultural vehicles fill the roads early in the morning. The diesel engines provide an early morning wake-up call as they growl and hum outside our home. Large white fruit bins are stacked high in vineyards ready to be filled with the bounty of 2015! This is an exciting time of the year. The buzz is contagious as winery and vineyard employees embark on the “busy” season. 20 hour days, over night harvests, and early morning crush pad action are finally upon us. I love harvest. This is the time when winemakers get the chance to showcase their skills. At Croze, we have not picked our first fruit yet, but we are getting close. I believe we will harvest our Chardonnay grapes in the coming 7-10 days. Overall, this season seems to be here a little early this year. We are a week or two ahead of schedule. That is one of the wonderful characteristics of agricultural business. We are never really in control. Mother Nature is always the one who dictates our time frame. As we put the final touches on harvest preparations, there is a nervous energy. The vineyards all look fantastic. We are looking forward to the chaos that brings us to the end product that we all love. Cheers to Harvest 2015! We are certainly spoiled here in Northern California with the bounty of produce and fresh herbs. Most of us grow culinary herbs as shrubs in our yards. It makes it so easy to craft excellent dishes that reflect the seasons. 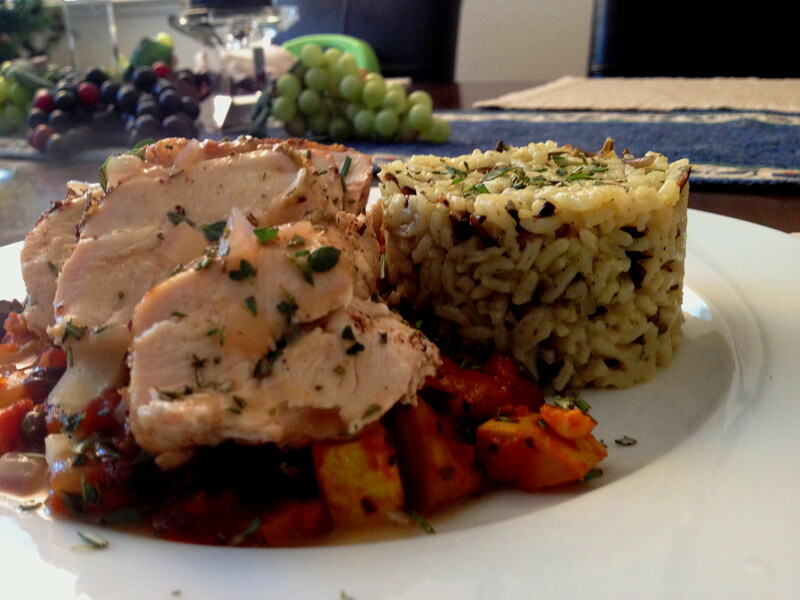 I have always felt that one of the biggest improvements home cooks can make to their food is to use more fresh herbs. One of my favorite side dishes to make in the summer is ratatouille. Our garden is a prolific producer of squash, zucchini, and egg plant. Outside of the basic vegetables you can greatly impact the flavor profile of your dish by what fresh herbs you choose to use. For summer I like a little thyme and oregano. In the winter I use heartier herbs like sage and rosemary. This is a really easy and basic dish. Sauteed the onion, zucchini, and squash in olive oil for 8-10 minutes. Add the garlic, salt and pepper, and continue to cook for another minute. Finally add the tomatoes and white wine. Let the mixture reduce for several minutes and add in your fresh chopped herbs. This dish pairs with just about any protein. 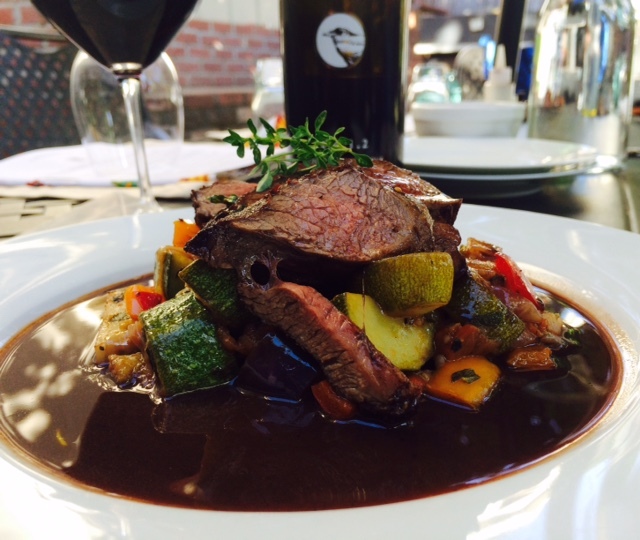 Here we serve grilled lamb sirloin over the ratatouille with a port reduction. This is fantastic with Croze Vintners Reserve Cabernet! As the calendar rolls to a new year, the time to begin preparing the vineyards for a new season rolls around. While pruning and vineyard maintenance are not the most romantic notion in the wine business, it is a vital part to the quality of the finished product. Each year as I set out hand pruning the vineyards that we manage, I find myself visualizing the upcoming season. Pruning the vineyard is a time of rebirth for the grapevines. We cut away the canes that brought us our amazing fruit last season and strategically set the grapevine up for harvest 2015. How we prune dictates where and how the vine will grow in the upcoming season. It can also greatly dictate the quality of the upcoming harvest. While it may seem like menial labor, those workers who are out in the vineyard are highly skilled and very knowledgeable. They are a huge part of the quality of any wine. To me this time of year is a magical time in the valley. As I walk the rows and prune grapevines, I rejuvenate myself and the vineyard. These hours of manual labor offer a time to put the 2014 harvest to rest and begin the journey towards the 2015 season. With the right amount of skill, passion, and care for the vineyard, Mother Nature will reward us with beautiful 2015 crop. The cycle of life in the vineyard is an amazing thing! It will not be long before we are celebrating the fruits of our labor. One of the things I love about the wine industry is the people. We have the opportunity meet and work with so many wonderful people who are so passionate about what they do. From grape growers, farmers, distributors, retailers, and wine lovers, the industry pulls together like-minded people. I was reminded of this the other evening when my wife and I sat down to dinner. Nothing super special for a weeknight dinner, but as I looked at my plate I was reminded of all the wonderful people in our lives. We had eggplant from the garden at Flinn vineyards (where we buy Cabernet Franc grapes). Heirloom tomatoes from Simone Vineyard (where we buy Chardonnay grapes), onions and zucchini from Tenbrink Vineyards (grapes for port), infused balsamic from Fezziwigs in Illionois (retailer who carries our wines), herbs from our own gardens, and local olive oil from friends of ours in St. Helena. We had a bottle of Croze wine and after dinner i enjoyed a cigar from our good friends at the Pipe and Pint in Greensboro, NC. Most of our dinner ingredients were made or grown by wine industry associates! Cheers and thanks for being part of a great evening.